- a fully equipped kitchen with a ceramic glass cooktop, oven and microwave. A bathroom with a shower-bath, a sink and a toilet. Both apartments have a size of 52 qm. They are on the 4th floor of a 5 story multifamily residence with a nice view into the garden, a park and the nearby sports stadium. 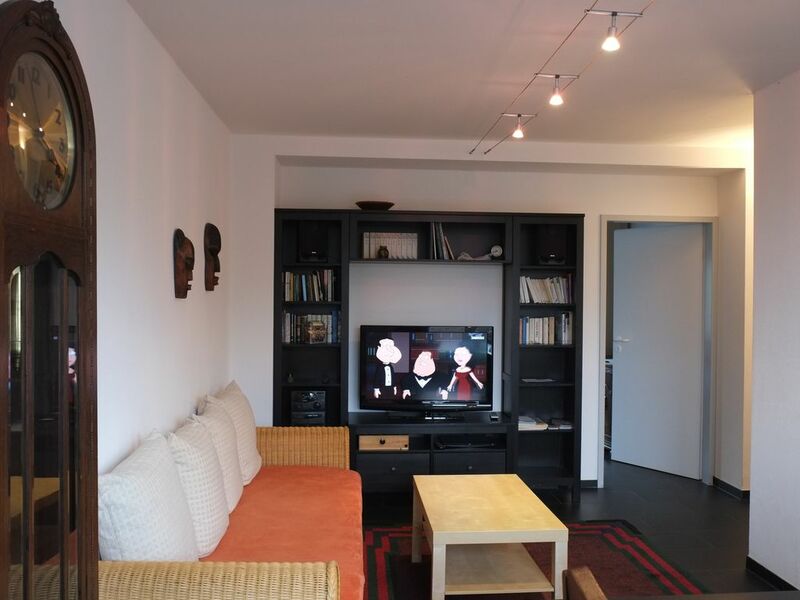 The apartments are light and modern furnished. Just outside the house is the tram stop 'Pohligstr. ', served by line 12 which runs to Cologne city center every 10 min. A ride to 'Rudofplatz' for example takes less than 10 minutes. Supermarkets, bakeries, butchers, banks, restaurants and pubs are nearby and can be reached in a few minutes by foot. Bed-linen is included in the rent. 2 towels for each guest are included. 37'' Flat screen TV - Full HD German channels. Please note: Check-In is between 12:00 - 20:00 h. Check-Out is between 7:00 - 12:00 h. Please contact me before you make a booking if these times don't suit you. Very patient with us being delayed arriving, lots of amenities within walking distance, easy tram ride to the city, comfortable, had everything we needed. My family recently stayed in this apartment in Cologne. We were very happy with the apartment, our communications with Arndt and the apartment manager who met us there with keys and information about the area. I highly recommend this apartment! Fully equipped and handy to trams. Big rooms for sleeping. A little bit outside of city centrum. The apartment was in good order when we arrived, clean and with everything you needed. Local bars were friendly and nice food. No 12 tram straight in to the town every 10 minutes, 200 yards away. Fantástica estancia en apartamento 1. Muy confortable y acogedor. Bien situado, a menos de 5 minutos de la parada de tranvia más cercana. muy buenas vistas y bien equipado (menage de cocina, despensa elemental, lavadora, secadora, secador de pelo, calefacción muy confortable, y colchones muy cómodos). Apto para 4 - 6 personas adultas. Realmente muy recomendable. Única pega que no hay ascensor !! Cologne (Köln) is like a three-dimensional textbook on history and architecture. Drifting about town you will stumble upon an ancient Roman wall, medieval churches galore, nondescript postwar buildings and avant-garde museums and concert halls. Germany's forth-largest city, founded by the Romans in 38 BC, has a long list of sightseeing attractions, led by its famous Dom whose filigree twin spires dominate the impressive Altstadt skyline. The Altstadt is also the best place to sample Kölsch, the refreshing local brew, in beer halls rivalling those in Bavaria in rollicking intensity. Cologne has numerous museums - art to chocolate to sport - among hundreds of art galleries to explore or concerts to attend. Alle Mietpreise beinhalten bereits die Kulturföderabgabe der Stadt Köln in Höhe von 5%. Die Standard-Miete beträgt 60 € pro Nacht inkl. MwSt. + 5% Kulturförderabgabe = 63,00 € Die Gebühr pro zusätzlichem Gast beträgt 20 € inkl. MwSt. + 5% Kulturförderabgabe = 21,00 € Gäste, die aus rein beruflichen Gründen in Köln übernachten, können sich von der Kulturförderabgabe befreien lassen.